Charles McKain (1947 - 2012). Credit: San Diego Democrats for Equality. 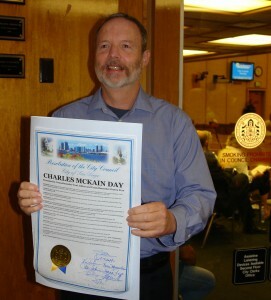 The Ocean Beach – Point Loma area has lost a strong gay rights advocate and Democratic Party activist as Charles McKain passed away on Saturday, March 17th. He and his partner of 36 years, Robert McWilliams, had a grand house up the hill from Sunset Cliffs in southern OB (some might call it Point Loma). They both were long-time activists in the local Point Loma Democratic Party club and used to have meetings all the time in their hill-side abode. Charles and Robert were legally married in 2008. I met them both when I ran for City Council waaaay back in 1987 (I garnered about 10%). They were stalwarts then of the liberal wing of the Peninsula and had opened their house up for Club meetings. I recall sitting in their livingroom explaining why I was a “small-d-democrat”. I have no idea if they voted for me then, but the two of them remained active for decades after. Charles McKain, 65, from San Diego, passed away on Saturday, March 17, 2012. Charlie retired as a staff attorney for the Fourth District of the California Court of Appeal. He graduated from Hoover High School in 1963, and went on to earn a history degree from Stanford University and Juris Doctorate from the UCLA School of Law. He was an active member in many local Democratic Clubs, and served on the board of the San Diego Democratic Club, now known as San Diego Democrats for Equality, for many years. He played a significant role in progressive politics during his time serving on the Executive, Rules and Credentials Committees of the California Democratic Party. In 1980, he was also one of the first openly gay delegates from San Diego to the Democratic National Convention, and also was elected as a delegate in 1992, 1996 and 2000. He also was a member and leader of the San Diego Democratic Central Committee. “After 30 years as an active and vital member of the San Diego County Democratic Central Committee, Charlie was given Lifetime Membership status on the Central Committee – a recognition that is reserved for a limited few who are truly dedicated individuals and whose leadership of the Party proved critical to our success,” noted Jess Durfee, Chair of the San Diego County Democratic Party. Charlie was also an avid basketball player, playing in as may as four leagues a week, including San Diego Hoops, the gay league. The high point of his basketball experience was playing in the 2002 Gay Games in Sydney, Australia for the San Diego team. Survived by his husband Robert McWilliams and sister Charlyne, Charlie and Bob were together for 36 years, and lived in San Diego’s Sunset Cliffs neighborhood, where they regularly opened up their home for political events and fundraisers. They became legally married in California in June of 2008. I’m going to miss that dude; he came into my life via Nancy as they were friends from way back. Whenever I hear people speaking negatively regarding gay relationships I think of Charlie (“Lucky”) and Bob. They were true soul mates. Their relationship got started at about the same time that Nancy and I began our 34 years together which ended with her passing in 2009. San Diego has lost one great human being, a man who dedicated his life to making the world a better place. view of gay relationships. In my opinion, Charlie touched so many and his philasophy to promote equality and peace.Charlie’s high caliber of achievements, education background and human kindness will endoctrinate a great role model for generations here in San Diego and beyond. I am in a five year gay relationship and relationships like Charlie and Bob were together for 36 years; it makes me acknowledged how rightful and reasonable about gay marriage. In my opinion, we all are children of the creator, God, the cosmos, you name it. my prayers for his family, Bod and friends. Thank you Charlie for promoting peace and equality in this fragile planet and colossal universe. I will miss Charlie. We met as friends at the Unitarian Church back in the mid 1980’s. Many times I went to his house for Democratic potlucks, fund raisers etc. He was a down to earth guy. With a wry sense of humor. It was hard seeing such an intelligent man and light of the Democratic and LGBT communities decline in heatlh. Charlie, If there is an after life. May you have a good time challenging the Republicans who have passed and are there too. And I can hear your wry sense of humor to my comment. A quiet giant has passed. Charlie, you will be remembered by many. Charlie was a regular at the Peninsula Y yoga class. We’d meet in the parking lot and exchange copies of the Nation. Bye Charlie, we miss your kind face and courage. There was something about Charlie that made even new friends feel like close friends. I know it was true for me when we first met. I worked with him at the Democratic Central Committee, saw him at the Unitarian church, and in the elevator at Symphony Towers where we both worked. A quick quip from him about events of the day always made me chuckle. During my last visit with him and Bob (and the only time I had been to their house) we looked at old family photos, perused his old Stanford yearbook (we had a mutual friend in his class), and looked at Bob’s photos of their Hawaii trips. Charlie’s health was failing, but his warmth, smarts, and sense of humor were evident, and will forever be remembered. Rest in peace, Charlie.